Indian Navy Recruitment Notification 2017 : Latest Notification for Indian Navy has 205 Steward, Chef, Hygienist Apprentices Posts. Online Application Invited by Indian Navy Notification. Last Date to Apply Online 9 July 2017 . Fill the Vacancies of 205 Steward ,Chef and Other Posts . 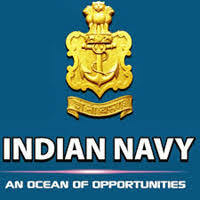 All Interested Candidates can apply online through Official website www.joinindiannavy.gov.in and alljobalert.in. Candidates should be Born between 01 Apr 1997 to 31 Mar 2001 (Both dates inclusive). 2. Applicants should click on Notification Link. 3. Then read the Advertisement carefully. 4. If you are eligible then you Open the Registration Form. 5. Candidates should fill up all the required details properly. 6. You must also uploaded scanned image of photograph with blue background. 7. Applicants should uploaded scanned documents with Online form. 9. Recheck your Registration Form. 10. Then you can submit your Online Form till the last date 09.07.2017.